This oversized book contains many large photos and gives a straightforward account of Japan's kamikaze operations. The author David Brown objectively tells the battle history of the kamikaze attacks from the Allied viewpoint. Much of the book reads like official combat reports, with ship names, number and types of attacking planes, defending aircraft, and casualties. Historical photos take up about half of the space of this short book, and they together with the captions give the reader an appreciation for the destruction inflicted on the Allied fleet by the kamikaze pilots. Although the last page has a listing of photo acknowledgments, Brown does not provide a bibliography to indicate his sources of information. His historical account seems accurate, but it is difficult to consider seriously a history book that provides no sources. 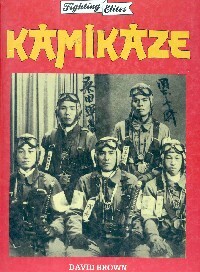 Unlike some other books on kamikaze, this book provides a nice description of the role in kamikaze attacks of not only the Japanese Navy but also the Japanese Army Air Force. However, the book lacks any maps to assist readers. Also, the author provides little information on the thinking of Japanese military leaders and the motivations of kamikaze pilots. This book provides a satisfactory battle history of Japan's deadly kamikaze attacks, but an introductory book such as Rice's Kamikazes covers the Japanese perspective in more detail and provides excellent documentation, two items missing in Brown's book.